Back in February, I brought you my reader mailbag, which featured a little Q&A session involving some "readers" and myself. "Real questions from fake readers." It was a fun little post, so I thought I'd do it again. QUESTION: So, um, what happened to The Flying Trapeezius? ANSWER: Oh, it still exists (here's the proof), but it's more of an archive now. I've decided to concentrate my efforts on My Kingdom for a Novel (or a Short Story). It serves the same purpose, minus the "autumn vomited here" layout from TFT. For better or worse, all my old posts are there. QUESTION: You keep trying to sell stuff on your website. Now you've got a "Matt's Store" tab on the blog. Why are you selling out? ANSWER: Listen, I used to be shy about this whole writing thing. I didn't talk about it much and kept it like a secret identity. But if I really want to do this--and I do--I have to be my loudest and best advocate. I'm trying to attract readers. I don't post a lot of my fiction on the blog--and maybe that will change--but the best place for people to get a sample is to visit Smashwords or Amazon.com. I'm not going to pretend I'm not trying to turn this into a career. QUESTION: You're doing it again. ANSWER: That's not a question. Next question! QUESTION: So if you're making so much money by posting your work on Smashwords and Amazon.com, why haven't you bought a yacht? ANSWER: Whoa, there! I never claimed to be making money. In fact, I said "I'm not going to pretend I'm not trying to turn this into a career." My Smashwords stories are free right now (just use the code "SSWSF" on the site). My Kindle versions are 99 cents. In royalties from both platforms, I've made $3.00 because a couple Smashwords customers didn't use the promo code. And some guy bought a story in the Amazon UK store. QUESTION: Will you buy me a value meal with all the writing money you've reeled in? ANSWER: I don't know where you're getting your value meals these days, but I want in. QUESTION: When you made the ABC's of Writing, did you realize you could've used a lot of other options? Like, instead of using "Agent" for "A," you could've used a real writing term like "Analogy" or "Alliteration?" ANSWER: I had multiple options for every letter in the alphabet. I was just going for terms that meant something to me. I may revisit the ABC's of Writing with another series of posts because I had a lot of fun putting it together. I'll think I'll go the Bases Loaded route and call it ABC's of Writing: Second Season. QUESTION: What's with all the meters? Shouldn't you have one with Ray Liotta? ANSWER: The Peyton Progress Meter tracks the development of a book or story from draft to submission. The Reggie Miller Writing Continuum tracks my word count for any given day. The Joey Votto Meter tracks my short story success rate. Ray Liotta? 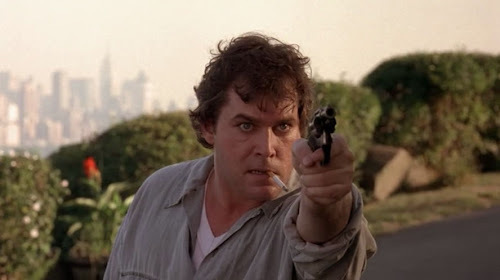 I think this blog could use a little Ray Liotta. QUESTION: What's the deal with self-publishing? Are you considering it? ANSWER: Hmmm. Well, considering I've already posted a few stories on Smashwords and Amazon, I would say I'm more than considering it. I've already done it. Do I have the confidence to try it with a novel? I don't know. I'll have to think about it. I had a full request for one of my manuscripts, so I'm keeping my options open. QUESTION: Do you have any exciting things planned for the future? ANSWER: I don't have any big blogging series coming up to rival the ABC's of Writing. At least, I haven't thought of any yet. I am considering doing an ebook superhero anthology. If I go forward with that, I'll have more news in the next few weeks. QUESTION: Are you reading anything right now? ANSWER: I bought a Kindle a couple weeks ago (my thoughts here). I just finished the first book of Michael R. Hicks' In Her Name: EMPIRE series (a review is forthcoming). I also read Pentecost by Joanna Penn (if I get into the groove, I'll try to review that, too). On deck: Swarm by B.V. Larson and The Pharos Objective by David Sakmyster.